No, your eyes are not mistaken. There actually is a second post from me this week! I’ve never actually posted twice in one week before! This is a bonus post – sort of a mini tutorial. It’s really just a technique that I wanted to talk about before we got too far into the holiday season. Today, I’m bringing you some ideas on how to turn your quilling crafts into ornaments to hang on your holiday tree or give as gifts. 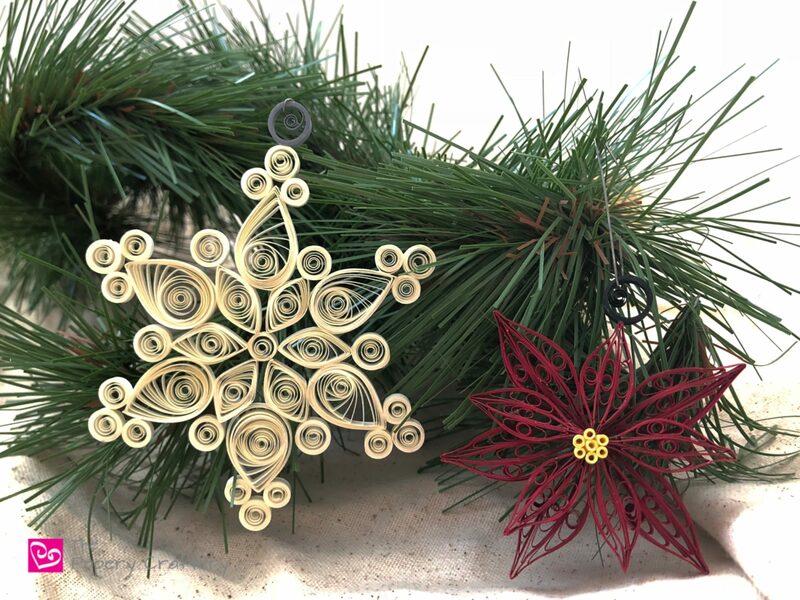 Most quilling crafts can be turned into holiday ornaments with little effort. There will be some quillings that you can just use a wire ornament hook. Take, the quilled winter gnomes that I just posted last week, for example. If you can, gently feed your wire through the center hole in their hat, and it should hang just fine. Keep in mind, if you’ve designed your gnome to have a crooked or springy hat, you will need another plan. Maybe make a small loop and attach that to the back of his head. Try to make the loop towards the top of the gnome so he hangs straight. My favorite way to turn my quilling into ornaments is to add traditional elements like a silver cap and a paper loop. When I make my traditional quilled Christmas balls (by the way, if you’re lucky enough to find a copy of the Better Homes and Gardens Holiday Crafts magazine from 2016, you can see the exact steps I use to make these. ), I use this same technique to make them look as realistic as possible. I form a small silver rectangle and attach that to the top. To add a little visual interest, I also like to add a silver s-scroll to the inside. That makes the rectangle a bit sturdier, too. Next, I make a thick loop with black quilling paper. First, roll an 8″ strip of black into a coil on a needle tool, but don’t glue the end. Next, keeping your tool in the coil, pull the end gently, until it is almost totally unrolled. Remove your needle tool, and form the strip into an open coil with your hands. There will still be a second small coil inside the larger one. Glue the loose end, and attach it to the top of the silver cap. There will be lots of quilling creations that won’t work with a silver cap because they don’t have a flat enough surface. You can just go without and use the loop all by itself. Here are some ornaments I made from one of the poinsettias and snowflakes that I demoed last year. It’s also not a bad idea to brush a coat or two of a sealant, like Mod Podge to make your ornament a bit stronger. In just a few minutes, my ornaments were ready to hang! If you’re going the handmade gift route this year, think about hanging a quilling paper ornament on a mason jar filled with your favorite treat. I’m thinking of making a couple batches of this caramel for our neighbors! I’m sure you could think of some other ways to use or gift your quilling paper ornaments. Maybe string them in a garland or use a ribbon to tie them on a gift box for an even more special surprise! In the meantime, let me know… what kind of ornaments you’re thinking of making this year. Excellent idea, and these make great gifts. They sure do. They’re always a “wow”! Making ornaments and cards for hospital holiday bazaar.Also trying tea light candle holders.